OKASOLAR® Glass is a passive, maintenance free solution for the solar control of a building. The glass cavity contains optically designed, fixed louvers for daylighting and heat reflection. Seasonal sun protection with excellent daytime views from the interior. Interior daylighting and contrast reduction. Energy efficiency has become a major factor in the selection of glazing materials for the building envelope. 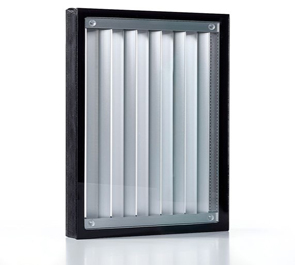 OKASOLAR®F Insulated Glass with fixed, integrated solar control louvers, selectively protects the building from heat gain while supplementing daylight levels. 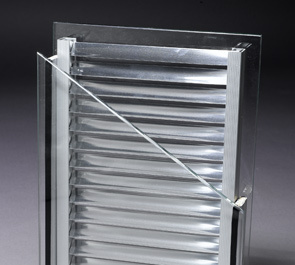 The newly developed, narrow profile louvers are placed in a 5/8″ glass cavity where they are protected from degradation and maintain their optimal reflectivity. Light levels can be customized to meet the requirements of the interior space. Natural daylight is reflected deep into the structure along the ceiling line, reducing the requirement for daytime artificial lights and lowering energy costs. Furthermore, by regulating the heat input into the building during the summertime, the cooling load is reduced. The result is an energy efficient interior featuring natural light that provides a high degree of user comfort. OKASOLAR®F with type O louvers reflects the daylight deep into the room. 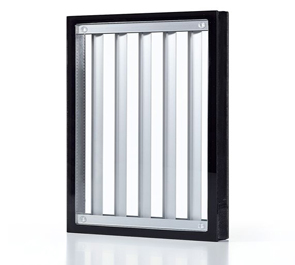 OKASOLAR®F with type U louvers reflects the majority of solar radiation back into the atmosphere. 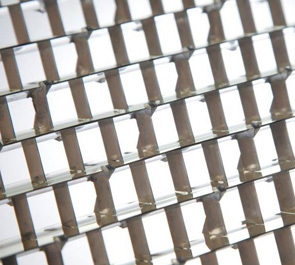 Due to the narrow louver profiles, horizontal transparency (57%) is very good. OKASOLAR®P is an insulating glass with fixed, vertical louvres in the cavity between the glass panes. Optimized for use in building facades, OKASOLAR®P enables partial transparency in one direction; at the same time, OKASOLAR®P provides privacy screening adapted to individual requirements in the other direction. OKASOLAR®S is a roof glazing and skylight glass designed for superior solar protection as well as excellent daytime views to the exterior. Selective mirror profiles reject direct light and heat from the South while facilitating wide open views to the North. 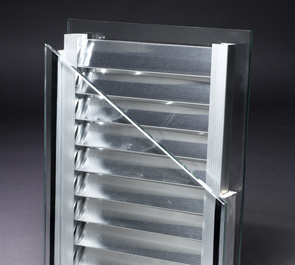 The positioning of the flat transverse cut off louvers enables partial transparency on an area of up to 80%, depending on the angle of observation. OKASOLAR®S allows you to achieve excellent U-Values with Solar Heat Gain Coefficients (SHGC) of as low as 9%. OKASOLAR®S enables an open roof design with views to the exterior without allowing the glare, heat and shadows associated with clear glass skylights. OKASOLAR®W is a passive, maintenance free, daylighting and solar control system placed within the cavity of a standard insulated glass unit. 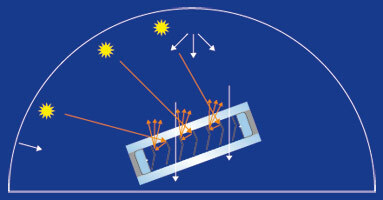 Natural daylight is redirected up to the ceiling by the three-dimensional, direction-selective mirror profiles, while excessive heat and glare are rejected. Daytime views from the interior to the exterior of the building are very good. A standard insulated OKASOLAR®W unit, when installed in a facade, can have a Solar Heat Gain Coefficient (SHGC) of as low as 12%. OKASOLAR®W provides enhanced end user comfort without the need for external sunshades or louvers. OKASOLAR®3D is an insulated glazing system with a three-dimensional, highly reflective sun protection grid in the cavity between the glass panes. The geometry of the sun protection grid has been optimized for roof applications. The direct solar transmission is blocked at all times, irrespective of the height of the sun. This effectively reduces the heat gain into the interior of the building. At the same time, a large proportion of diffuse daylight from the northern hemisphere gets into the interior. This results in even light distribution in the interior and significantly less fluctuation in brightness than with direct sunlight. For façade glazing we recommend our products OKASOLAR®W and OKASOLAR®F. When compared with common insulated window panes (Fig.1), the lighting conditions can be optimized by using OKASOLAR®F O and OKASOLAR®F U (Fig.2).